orchard | eat. drink. cook. travel. My brother treated us to brunch at the St Regis and what a champagne brunch it was! 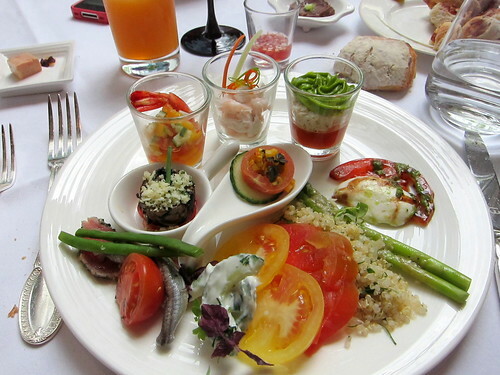 It was well-priced compared to other hotel brunches at $170++ with champagne and $138++ without. What I didn’t like was that there wasn’t an option with just one glass of champagne, that I would’ve gone for. They offered a la carte glasses of champagne for $40, which made it more expensive than the option with free-flow champagne. Pfft. No less, the spread was excellent. While not quite as extensive as other places, there were very few filler dishes. I liked also that the quality of the ingredients was excellent. 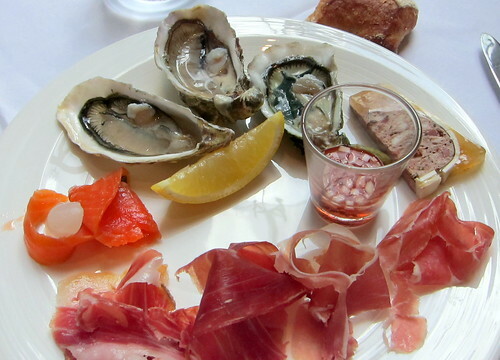 Case in point were the oyster and ham selections. There were three types of oysters from various regions – all were good, and the memorable ones were the fine de claire from France. I love their briny, minerally flavour. The ham selection was more impressive, with four or five different types. I remember the parma and some of the air dried beef types, but everything was blown away by the entire leg of bellota ham carved out in tempting slivers. The flavour of the fat from acorn fed pig blew everything else out of the water. You have a choice: either eat the other hams first or go straight for the bellota. No other way. What made this buffet special was that the food wasn’t all from the buffet table where we helped ourselves. The waiters regularly came round with small bites, such as this sampler platter of (L-R) tomato gazpacho, tuna tartare, foie gras in the style of creme brulee, deep-fried silver bait, and marinated olives. I enjoyed the gazpacho and tuna tartare a lot – so refreshing, while my mum and aunt adored the foie gras. There were plenty of other yummy bites brought round, including cubes of braised beef cheek, deep-fried prawn in a pastry net, pan-fried foie gras and truffle risotto. All very good. There was plenty more in the buffet spread, including an inventive quinoa salad, heirloom tomatoes and a good assortment of salads, from seafood to pure vegetarian ones. The mains were a la carte and each person could order only one dish. After the incredible spread from the buffet line and the bites brought to the table, I think one would be hard pressed to even contemplate finishing two mains anyway. 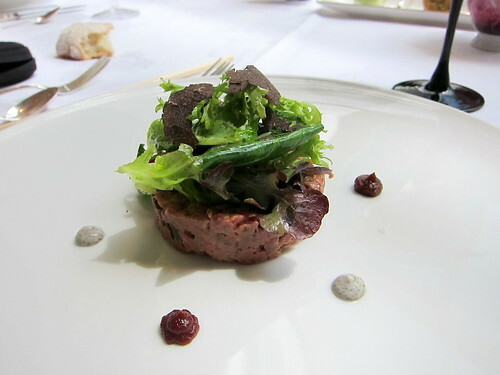 I had the beef tartare (this dish seems to feature regularly on this blog) with truffles, which was a good rendition, though the flavour of the beef could have shone through more strongly. Perhaps my palate had been jaded by then. Perhaps the best options would be either the beef tenderloin or the Hokkaido scallops, if they don’t change the menu every week. We were stuffed by now, but had to press on. 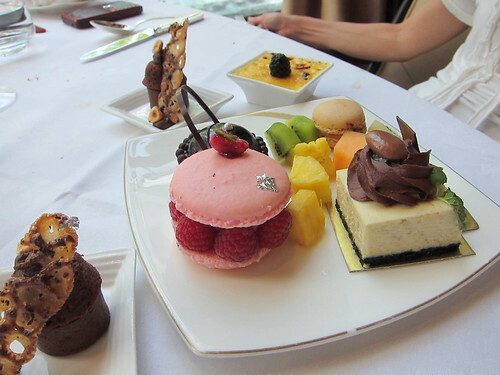 There were desserts aplenty for us to get through. It all seemed to pass in a blur, but the standout was the giant raspberry macaron. Here was one of the few places that did macaron well and accompanied it nicely with good produce. The raspberries were tart and on the verge of sweet, a good foil to the sugary macaron. The rest of the desserts were decent, the only grouse being that the fresh fruit selection wasn’t very good. DC’s father insisted that we try out OChre despite us wanting to dress down. We finally got round to getting me out of my usual casual garb (think T-shirt, three-quarter pants and slippers) and into a nice dress and heels. We were pleasantly surprised by this place as the food is pretty good and the prices pretty decent. The cooking is almost classic Italian, with a Japanese sensibility to it. No surprise from a Japanese chef trained in Italy. There’s a restrained elegance to the dishes done well, and a disconcerting feeling of blandness and not quite bringing out the ingredients’ full potential in those not so well executed. We opted to share the antipasti and primi plati before having our own mains. 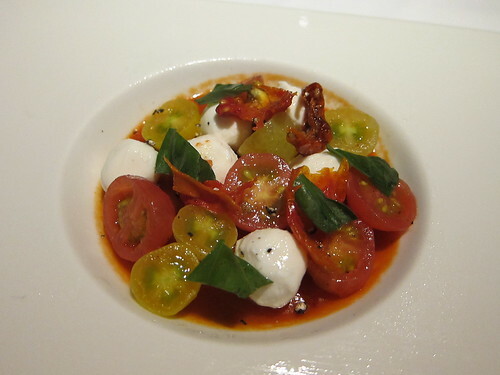 The first appetiser of tomatoes and bufala was decent as the tomatoes were ripe and sweet and the bufala creamy and fresh. I wasn’t sure about the tomato jelly as it was basically solidified tomato soup that didn’t add much to the flavours and didn’t help to unify the dish. Decent but no a reorder. 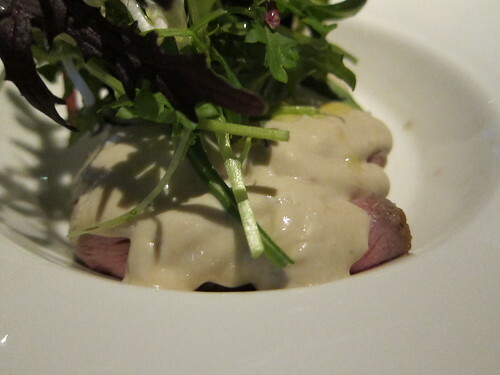 Next was the tonno vitello, slow poached veal topped with tuna sauce. Everyone else seemed to like it, but as it’s not my favourite dish, Ican’t quite comment on the execution. The only thing is thatI felt that it wasn’t a great deal different from the more downmarket version at Riciotti. I liked how the veal was tender and didn’t like how the cooked tuna in the sauce made it all quite rough in texture. 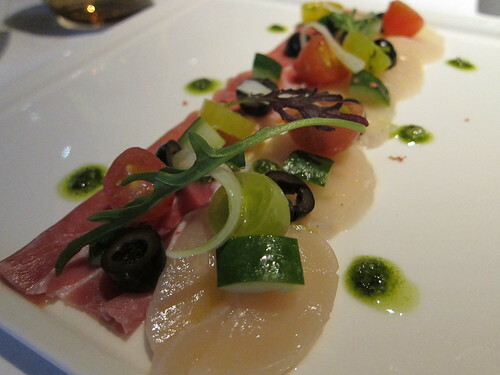 The last appetiser was the crowd pleaser: Hokkaido scallop carpaccio with parma ham. The scallop was impeccable, sweet and very slightly briny at the same time. The parma ham was passable, not great, and somehow didn’t quite go with the delicate scallop. Eaten separately, I think this works well, but not both ham and scallop in the same bite. I think the ravioli is where the chef really shone. I don’t remember much of the filling (was it kurobuta pork? 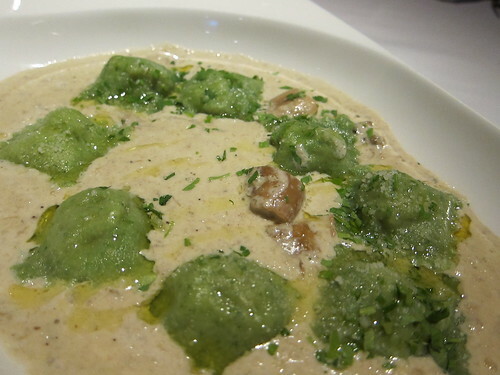 ), just that the little parcels were nicely al dente with chewy, salty filling, and oh the sauce! The sauce was a creamy mushroom sauce with ceps in them. I cannot tell you how much I love the soft texture and gently yet seductively woody flavour of ceps. Cooked into the amazingly creamy sauce, this really made my evening. 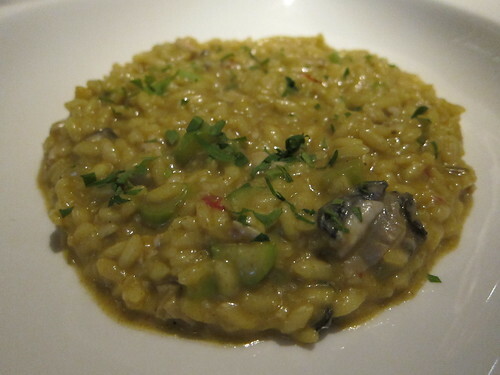 The oyster and saffron risotto was a decent rendition, again not much different from a version at another restaurant, this time Prego’s. I liked the asparagus bits in it, but wasn’t too enamoured by how they couldn’t bring out the clean briny flavour of fresh oysters in this dish. While the oysters were definitely fresh, there was a hint of fishy that I can’t quite place or explain. Perhaps cooking the oysters slightly affected the delicacy of the risotto. Perhaps I also didn’t like that the rice was a bit too hard for my taste. Who knows. The chef’s specialty is the duck risotto. I thought it was quite different as it broke away from the mold of risottos being defined by the stock it’s cooked in. This time, I think the chef used water instead of stock and the rice had a very clean taste, quite akin to that of watery porridge made with Thai jasmine rice. 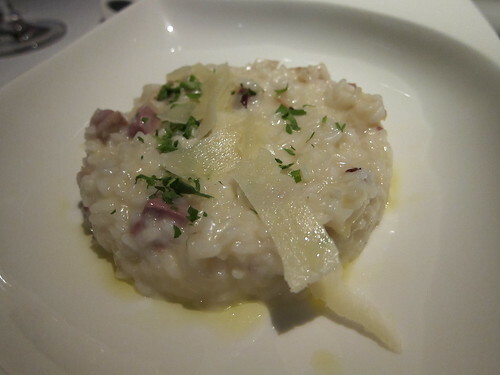 Studded in the risotto were cubes of smoked duck, lending little taste explosions of gamey salt to the tongue. It was a good dish but again the rice was too hard. I prefer it cooked a tad more, probably 30 seconds more stirring in the pot and I’ll be a happy camper. On to the mains. DC and I shared a beef with foie gras and they portioned them out nicely onto two plates. The funny thing was that they didn’t ask how we wanted the beef done and protested that we should go with the chef’s preference of medium rare. We both like our steaks Bloody and vetoed that in favour of rare. It was almost comical how the waiter kept asking if we were sure. I liked the steak and accompanying vegetables very much, it was all very well executed and the natural flavour of the beef shone through. 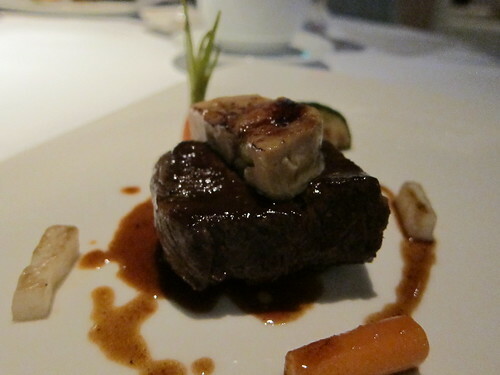 The foie gras I felt was superfluous and added nothing to the dish. I’ll give it (foie gras, not steak) all to DC next time. For dessert, DC and I shared a mille feuille, which we felt was the best dessert of the evening. 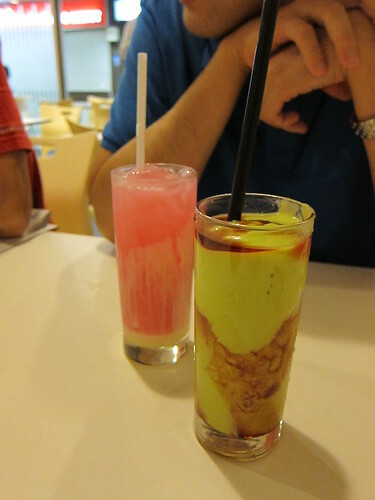 (There was also panna cotta and creme brulee, which seemed slightly disappointing to the rest.) 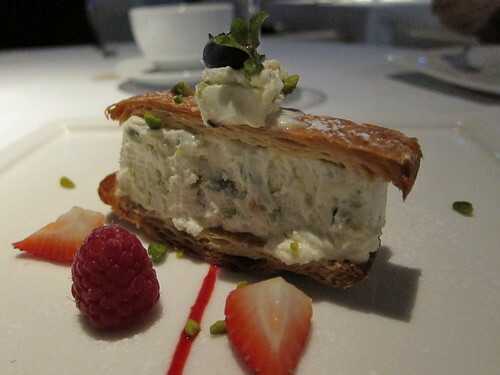 It was puff pastry with pistachio semi freddofilling. The semifreddo was excellent, being smooth, creamy and full of toasted pistachios. The pastry was a bit too difficult to handle: while crisp, it was a bit too hard and impossible to cut out to eat with the semifreddo filling. Nonetheless, taking a bit of pastry and a bite of semifreddo, this was a great dessert. A few last words on the service: fairly attentive though a bit lacking in the common sense department. One chose to make slightly disparaging comments of the very old Burgundy that DC’s father brought for dinner, not realising that though it wasn’t a Bordeaux (hey Bordeaux doesn’t automatically make a wine good!) it was a good vintage from a respectable vineyard. Later when asked our opinion on the food, one of them rather snippily said that the risotto was done that way in Italy. That certainly wasn’t the case in my recent trip to Italy (more on that later, oh my, one Michelin star heaven!) where risotto was done al dente rather than just off the verge of crunchy. Last, they didn’t do anything to clear away the bread basket that was obviously in the way, just says that the attentiveness is a bit of a show. OChre’s definitely flawed, but the food has lots of promise, just having one or two things in each dish that if tweaked, would take it right up there in the good food stakes. De Ste has some pretty, and pretty expensive cakes! After having dinner at Oriole, we strolled past in search of dessert and discovered that whole cakes are discounted by 40% after 8pm. For those interested in smaller cakes, the one-person portions are similarly discounted from 11am to noon. We couldn’t resist the good deal and ended up taking home a Stefano’s Grandma Cake. Look at how big the box was! It felt like we were taking a hatbox home. 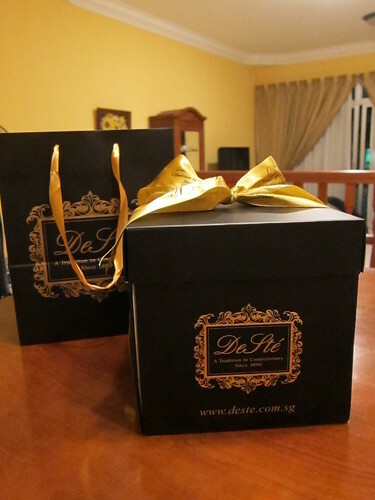 The cake itself was much shorter than the box, probably because they use the same size box for all their big cakes. Some of the other cakes were rather… architectural. 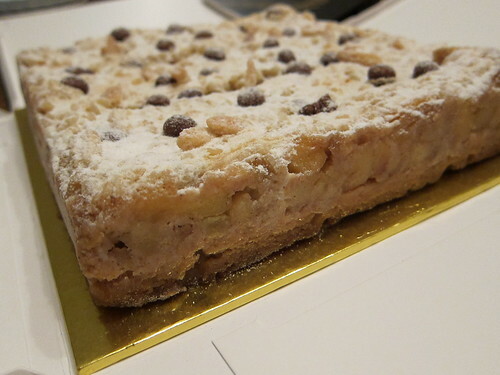 The Grandma cake tasted really nice, something like an apple streusel on a cake base. It was scattered with meringue and chocolate chips and tasted like it had some liquor inside. There’s a catch to getting the cake late though – it’s a bit soggy by the end of the day, so not a good idea to buy to give away. I finally got round to trying Pepes with DC and his parents. 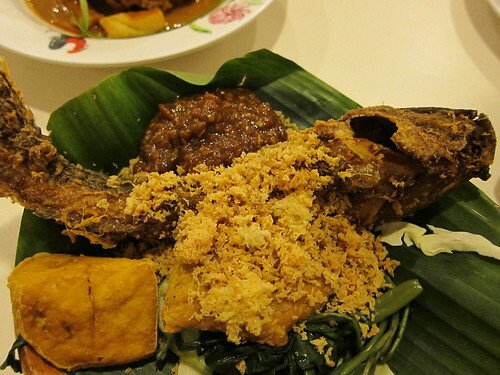 I’d heard quite a bit about how it’s a reincarnation of the former Sanur, just that a few dishes were tweaked so it’s slightly healthier and less oily. 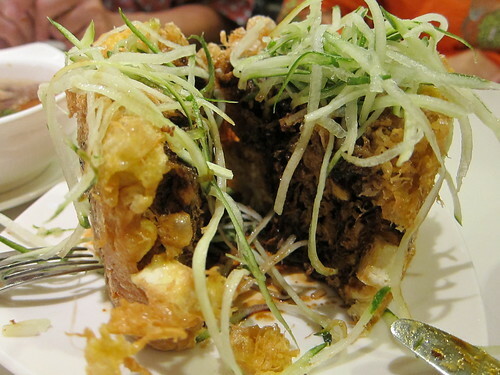 We started with the tauhu telor, the ubiquitous stack of tofu deep fried with egg and served with kicap manis. It looks like there isn’t enough kicap manis in the picture, but this is the good healthy bit: it’s up to you how much or how little sweet black goodness you want on your tauhu telor as they provide extra in a side saucer. It’s great how the deep-fried egg bits were softly crispy and had none of that nasty oil ooze. They used very tasty good-quality tofu as well. A winner! 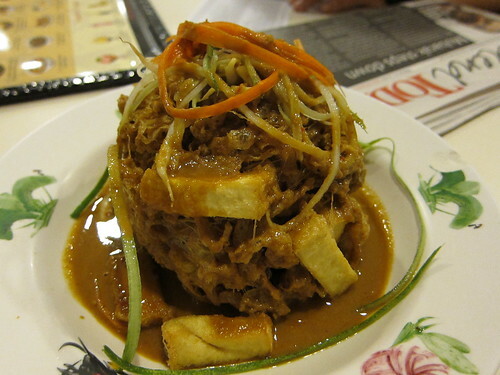 Next was the sup buntut which I enjoyed a lot. 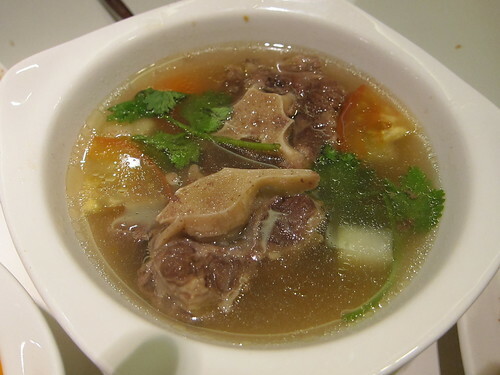 The soup had clear, bright flavours and very tender oxtail. DC commented that it tasted like they added Maggi seasoning, but I thought it was fine. Maybe Maggi seasoning adds that authentic Indonesian flavour? 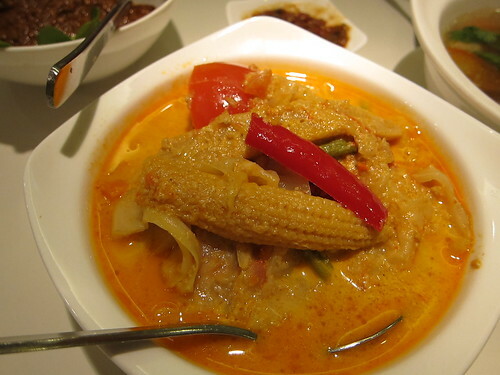 The sayur lodeh was average with nothing particularly memorable, neither was there anythingparticular to complain about. 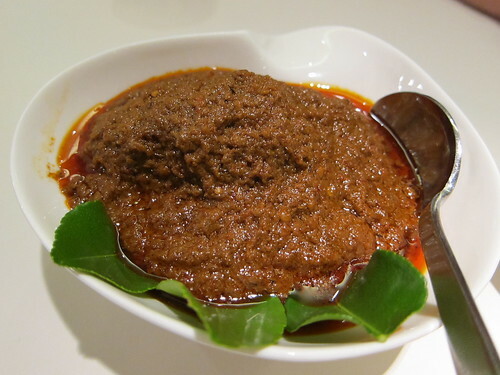 But the beef rendang really lived up to its hype. It really was very excellent. Don’t be deceived by the gloopy looking gravy. (I’m guessing that it’s like that because they use a food processor for the rempah, but I’m not that much of a purist so not complaining about that.) The mix of spices, together with the coconut and the gentle heat of the chilli was an epiphany. I also liked how the meat was quite tender (though beef somehow never gets quite as tender as mutton) and came in large pieces all the better to mop up the sauce with. The barbecued squid was a bit of a pleasant surprise. They updated this traditional dish by topping it with chopped ripe tomatoes and they really added oomph! 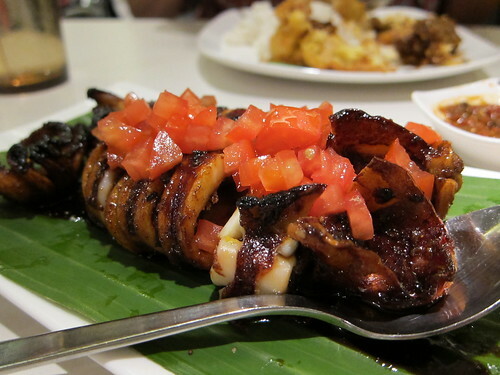 I liked the interplay of charred chewy squid with smoky sweet sauce and sweet, tart tomato. Another good dish. Get there before 7pm and you’re more likely to get a table, otherwise call ahead. I went to Plaza Singapura for a quick lunch one weekday with a colleague and headed to an old favourite: Hot Tomato Express. I love how no-nonsense both the food and the prices are, and how the service is friendly and flexible. The set menu included either hot tea or pre-mixed iced lemon tea. Not only were they good enough to give us hot tea with ice instead of the usual over-sweetened iced tea, they also gave us lemon in the tea without us needing to ask. Plus, they even provided extra ice in case one glassful wasn’t enough. Now that’s what I call good service. The food’s good and cheap too. 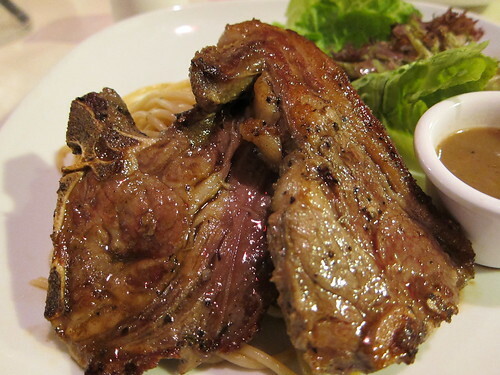 I liked the lamb chop with aglio olio spaghetti. It costed only $13 for the set including soup and tea. The soup that day was tomato soup, a thick chunky version served with crisp garlic bread on the side. On to the lamb chop. It came with two generous chops, both nicely seared and browned on both sides. They were on the fatty side, so not for diet days, but the fat made such a difference! The brown sauce on the side made the (again!) generous serving of spaghetti very yummy and the green salad on the side was yet another bonus. 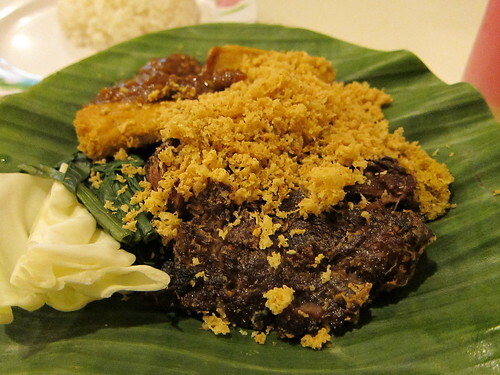 In short, a great place for quick, cheap and very satisfying food. Ever since spying Applebee’s from across the road at Oriole cafe, I’ve been wanting to check out this American chain diner. I remember reading a blog somewhere in which some random American girl (I know, not a particularly good source) said that it was her all-time favourite and was intrigued since then. 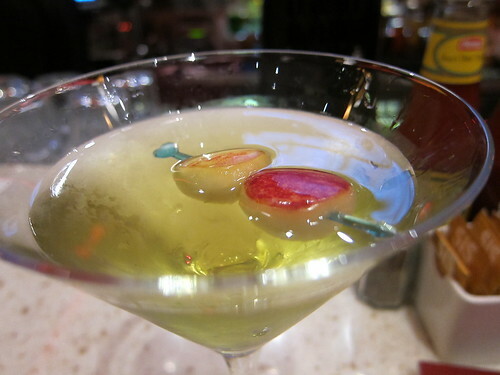 We started off with a Sour ApplebeeTini, an apple-flavoured martini with a cute stick of apple pieces to garnish. It was more apple juice than alcohol and not particularly sour, though very palatable. This is one of those drinks that you could easily have on an empty stomach, it’s so mild. I’d imagine teenagers would adore this drink. Not your manly man type drink but very apt for the place and the food. DC the burger king ordered the Fire Pit Bacon Burger. It was a big burger with an even bigger portion of fries on the side. The seasoned fries were very good: soft inside and crispy outside. It was a good start already. 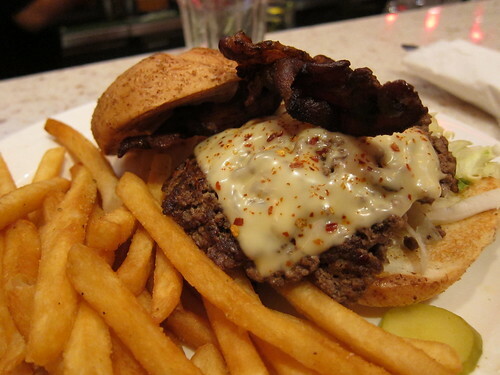 The burger was very well seasoned, though I felt it a tad overcooked. It could be juicier but the melted cheese topping compensated nicely. No big deal with the jalapenos, they hardly added any heat but then again this is Singapore and we’re used to far hotter. I wasn’t very keen on the bacon because it was a bit too burnt and didn’t taste very bacony. But on the whole this was a very good burger with a nicely toasted bun, loads of ingredients that made a mess and excellent fries. 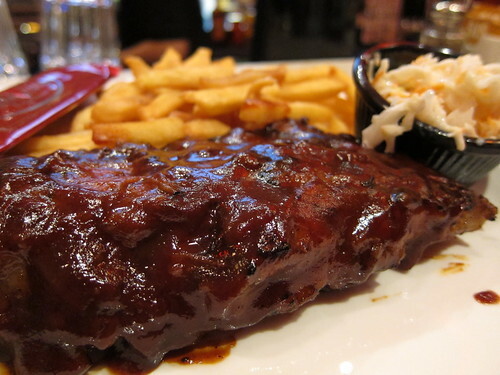 I had the half rack ribs with Southern BBQ sauce. Those ribs were quite something. They were incredibly soft and tender with the meat practically falling off the bone and coupled with the sweet, smokey BBQ sauce, ambrosial. I don’t normally like sweet mains, but this was an exception. The accompanying coleslaw was surprisingly fresh and good quality. Coupled with the aforementioned excellent fries, this dish seemed pretty faultless to me! Now despite our full tummies, we couldn’t leave without trying dessert could we? There was no choice but to share a Maple Butter Blondie. 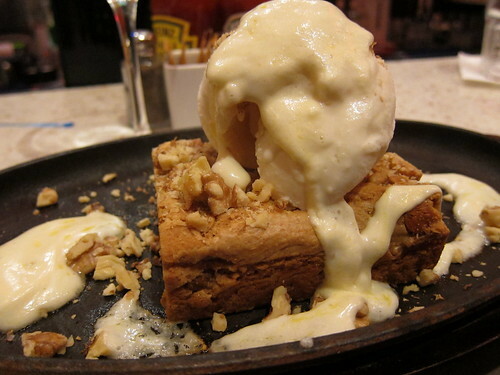 The blondie was served topped with vanilla ice cream on a hot skillet and maple butter sauce was poured on top to sizzle away. This was one of the few desserts that really worked the contrast between hot and cold, making it very special. I especially loved how the maple butter sauce caramelised on the skillet. Eating that those bits with the crisped up bottom of the blondie with cold creamy ice cream was such a sensation to savour. In short, expect loads of good, honest to goodness American food. None of it is gourmet, but it’s got me wanting to go back very soon! So DC and I did go back another day. This time DC had the steak. Don’t bother with that sinewy excuse for meat, just head straight for the fajita combo. 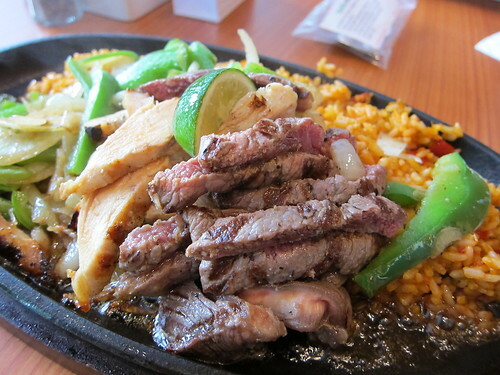 This sizzling plate of seasoned rice has lovely strips of beef and chicken nestled on a huge pile of onions and peppers. 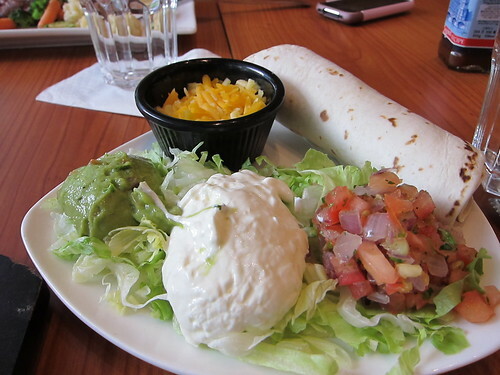 Accompanying it was a generous plate of four tortillas, shredded cheese, guacamole, pico de gallo (basically onion and tomato salsa), sour cream and shredded lettuce. Making up the tortillas so that I didn’t overstuff them was a big challenge, I’m so greedy. I wanted a bit of everything inside and ended up squishing half the contents onto the plate by the time I got through the tortilla. It was very yummy though, with plenty of spice and smoke from the meat and onions and creaminess from the guacamole and sour cream. There’s enough for two people, so you could try sharing and ordering more starters and desserts. I certainly couldn’t manage a blondie dessert the second time round!